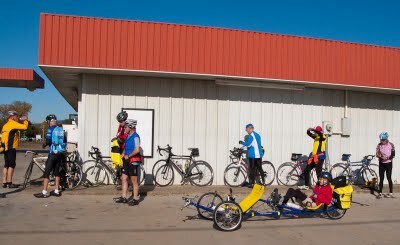 A few days earlier, I had received an email from the Arkansas Bicycle Club with some of their upcoming rides listed and one of them was a ride from Danville, AR to Havana and then up Mt. Magazine. When I first read this idea I joked to Aly that we should do that. We laughed and time marched on but later in the week I found myself thinking "ya know... I think we actually could do that." When the day arrived, Aly didn't feel good so she stayed home to try and fight whatever bug she had off while Mandy and I packed up our tandem recumbent trike and headed to Danville. 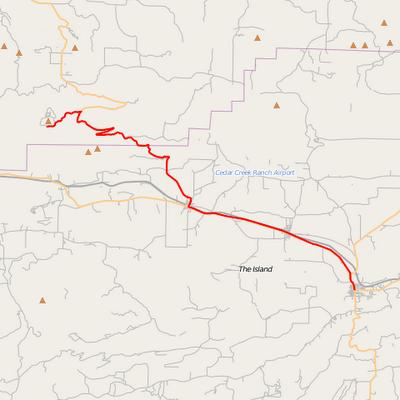 In addition to riding up the tallest mountain in Arkansas, we would have a ham radio and GPS unit on the bike which would sent our position reports every two minutes. This was our first time trying that out and Aly would be at home monitoring our progress off and on throughout the day. In the photo above, you can see the GPS unit and radio. If you click on the photo you'll be able to see notes explaining each of the parts. 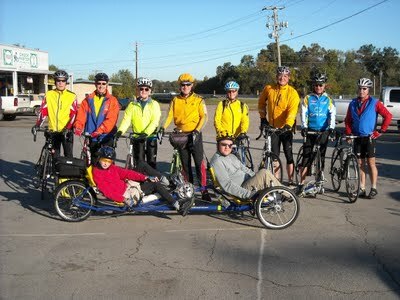 So... recumbents aren't known to be good climbers and trikes even worse so... and we had a tandem recumbent trike! This would be the tallest and longest climb for either of us, over 2500 feet of climbing and ~21 miles from the bottom to the top. That 21 miles includes the 10-12 miles of "warmup" ride to get to the start of the climbing as well as the rolling hills in the last 3-4 miles on top. The group waited for us at the gas station in Havana which is about 9 miles from the starting point. With the warm-up over, we turned off Highway 10 and headed for the top of Mt. Magazine. As I mentioned, this was an ABC ride but everyone else was on their two-wheeled-skinny-tire-go-fast bikes so we didn't see them once the climbing started. They made sure we got to the top (about two hours after they did) but then they all headed down and back home. So this "group" ride was more of a solo outing for Mandy and I with a few people in the vicinity that we knew. Once at the top (about five hours after we left our vehicle), we stood in line for the lunch buffet at the Lodge and my legs were so week I had to keep sitting in nearby chairs! After about 30 minutes in line, we were finally seated and lunch could actually begin. We took our time, enjoying the cold water and comfortable seats. After eating we found a sunny spot and a couch to sit on and rested while our bodies processed the food. While waiting we watched a wedding take place outside, hang-gliders floating above the Lodge and we flipped through a photography book about Oklahoma. 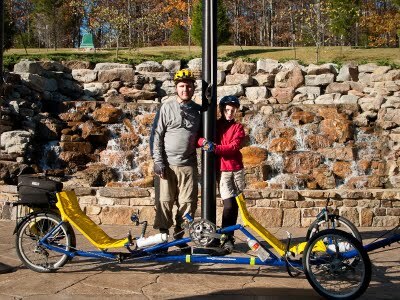 As we were leaving, we had a nice lady take our photo and we answered her questions about our ride up. 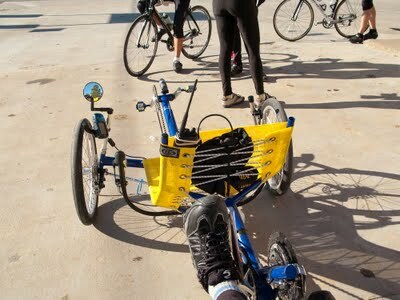 She was familiar with recumbent trikes because, get this, many people in her retirement community have them! The ride down was a blast, we wore our rain jackets to cut the wind and kept the speed under 41 mph! The bike was super smooth and stable at that speed and we arrived at the bottom only 40 minutes after leaving the Lodge! What had taken nearly four hours to climb up, took only 40 minutes to ride down. I've ridden my bike down the other side of Mt Magazine but this ride was so much sweeter since we actually earned it (instead of driving to the top). The GPS data for this ride can be downloaded from here.